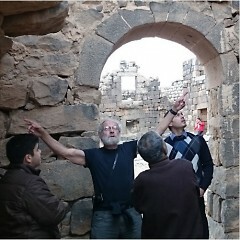 Bert de Vries is Professor Emeritus of History at Calvin College and Director of the Umm el-Jimal Project, an archaeological site in northern Jordan. Bert de Vries is Professor Emeritus of History at Calvin College and Director of the Umm el-Jimal Project, an archaeological site in northern Jordan. Over the past ten years the focus of the work at Umm el-Jimal has moved from mapping and excavations to “Community Archaeology,” which involves engaging the modern community in the preservation and presentation of the site’s archaeological heritage to visitors. Since 2012 Bert and his wife, Sally de Vries, have also raised funds for Syrian refugee families living in Umm el-Jimal.